Don’t believe the “experts” – Trump sent Pence to the APEC Summit not because he could care less about the Asia-Pacific, but precisely because he cares so much about the region that he wanted to insult its rising hegemon by dispatching his subordinate to issue an ultimatum to Chinese President Xi instead of doing so himself, thereby inflicting a tremendous loss of “face” that embarrassed Beijing to no end and set the stage for what’s bound to be an unforgettable G20 gathering at the end of the month. The Mainstream and even Alternative Medias are engaged in a coordinated campaign of “damage control” after Trump severely insulted President Xi by sending Vice President Pence to the APEC Summit instead of going there himself. The prevailing narrative is that the American leader apparently couldn’t care less about the Asia-Pacific region and therefore decided to blow it off and disrespect all of his counterparts who attended, but this is absolutely untrue since Trump has done more than any US President in history when it comes to “containing” China. Understanding the East Asian mindset, his administration knew that it would get under the Chinese’s skin if he dispatched his subordinate to the same event that the President of the People’s Republic would be attending, and worse still, to have Pence deliver the ultimatum that the US is ready to wage an “all-out cold war” against China if Beijing doesn’t bow to Washington’s demands. Proverbially putting his money where his mouth his, Trump also had Pence announce that the US will be partnering with Australia and using its ally’s forthcoming base in Papua New Guinea’s northern island of Manus, which is doubly provocative because this country hosted the APEC Summit and is one of China’s main partners in the South Pacific. Without a doubt, Trump calculated that his deliberately disrespectful actions would lead to China losing so much “face” that it might either surrender to his government’s demands and agree to a euphemistic so-called “truce” before the G20 gathering at the end of this month or double down on its current course of action and possibly overextend itself to the US’ long-term strategic benefit. The Chinese have a rigid social decorum that mandates that certain categories of people be treated with the utmost respect, but Trump did away with all of that by sending Pence to APEC. 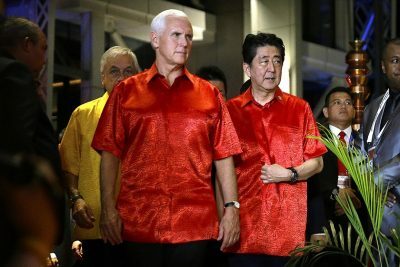 The Vice President’s attendance at the event was meant to convey a few subtle messages to Xi, the first of which is that Trump is dead serious about reaching a deal to end the “trade war” in America’s favor as soon as possible and isn’t afraid to humiliate his Chinese counterpart on the world stage in his pursuit of doing so. Secondly, Trump is naturally very angry at Xi for not caving into the US’ demands, hence why he decided to throw his purported friendship with the Chinese leader away by dispatching Pence to insult him in a manner that would lead to him tremendously losing “face”. Trump was basically signaling that he regards Xi as a regional leader from the Asia-Pacific and not a global one worthy of his time, let alone his respect since he didn’t deign to issue the “all-out cold war” ultimatum to him himself. In response to this unprecedented series of insults, China’s allies in the Mainstream and Alternative Medias raced to concoct a “face-saving” narrative to protect Xi’s reputation by alleging that the American leader abandoned the Asia-Pacific region because his country simply can’t compete with China there, ergo why the President didn’t think that it was worth his while to attend the APEC Summit. Such a simplistic storyline overlooks the Quad’s evolution into the Hex (which includes Vietnam and France) and the US’ newly promulgated “BUILD Act” that aims to form the basis for all of its partners to multilaterally compete with the New Silk Road. While not all that impressive in and of itself, this act of legislation can bring together the participants of the joint Indo-Japanese “Asia-Africa Growth Corridor” and have a major knock-off effect in attracting much-needed private investment. Paired with infowar techniques, it might yet prove itself formidable in the long run. Despite their best efforts, China’s international media allies can only change their audience’s perception of reality and not the way that reality objectively exists, meaning that they’re unable to do anything to tangibly give China an edge in its possibly impending “all-out cold war” with the US apart from counteracting some of its infowar attacks. Sometimes, however, it can be a disservice to their audience to alter the way that reality is perceived to such an extent that it becomes unrecognizable to the real thing, such as pretending that Pence’s attendance at the APEC Summit in place of Trump was somehow a sign of weakness on America’s part instead of the serious insult that it was to Xi and his country on so many levels. This set the backdrop for the upcoming G20 gathering, where Trump will either patch things up with Xi like he did with Kim earlier this year or go all out in trying to “contain” China.